For theater lovers living near NYC, find showbiz treasures, meet cast members and bid on backstage experiences as part of the 28th Annual Broadway Flea Market & Grand Auction. 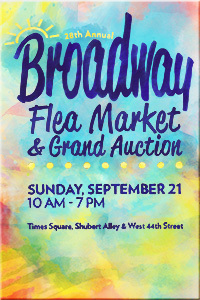 28th Annual Broadway Flea Market & Grand Auction is Sept. 21./Image courtesy Broadway Cares/Equity Fights AIDS website. WHERE: Times Square, Shubert Alley and West 44th Street. WHY: It’s loads of fun, you’ll find stuff here you can’t find anywhere else and you help raise money for Broadway Cares/Equity Fights AIDS. Besides, you can catch a show while in the vicinity. “Search for that missing piece of your Broadway collection, including out-of-print cast recordings and lost Playbills from almost any show you can imagine. Get lost in the stacks of signed memorabilia, costume sketches, props and photographs. There are treasures to be found in every price range,” the website promises. Last year, the Broadway Flea Market & Grand Auction raised $631,222, bringing the event’s 27-year total to more than $10.3 million. For more info, click here.